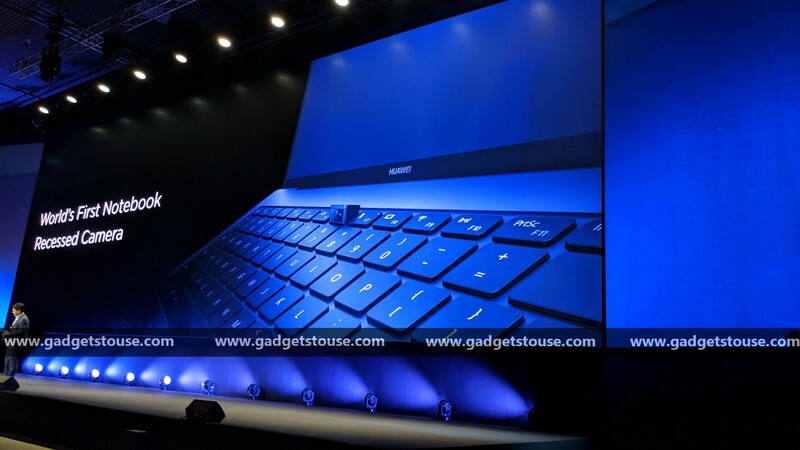 #GTUMWC2018: Huawei released a new Ultrabook at MWC 2018 with lots of new things which are generally not expected from these laptops. The Huawei Matebook X Pro is a thin laptop which comes with a FullVision display with super thin bezels around it. It comes with everything which you see in a traditional notebook but with a twist. The Huawei Matebook X Pro also comes with a retractable webcam which is embedded beneath the function key, and the key pops up whenever the webcam is needed. 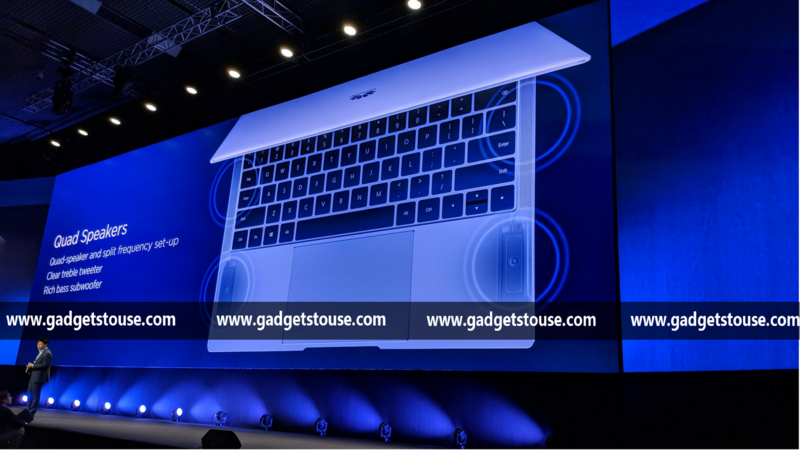 The Matebook X Pro comes with a metallic build with a black keyboard, and the dual speakers are provided on both the sides of the keyboard. It comes with a 14 inches display, and the screen has a bezel as thin as 4mm, on every side. And because there was no space left on the bezels, Huawei has embedded the webcam under the function key. The power button on the Huawei Matebook X Pro comes with a fingerprint sensor built right in, and it works with Windows Hello. The display has a 4:3 aspect ratio with 3,000 X 2,000 pixels resolution, and Huawei has used an OLED panel for this Ultrabook. Under the hood, the Matebook X Pro comes with an option of 8th generation Intel Core i5 or Core i7 processor. It comes with up to 16GB of RAM and 512GB SSD storage for blazing fast operation. It packs a dedicated NVidia GPU to handle intense graphics, but it is an optional variant. For connectivity, this laptop comes with two USB Type-C ports and one USB Type A port. It charges using the Type C port, so you don’t have to carry a charging brick around with it. Huawei is shipping this mighty beast without any bloatware installed, just pure Windows 10. 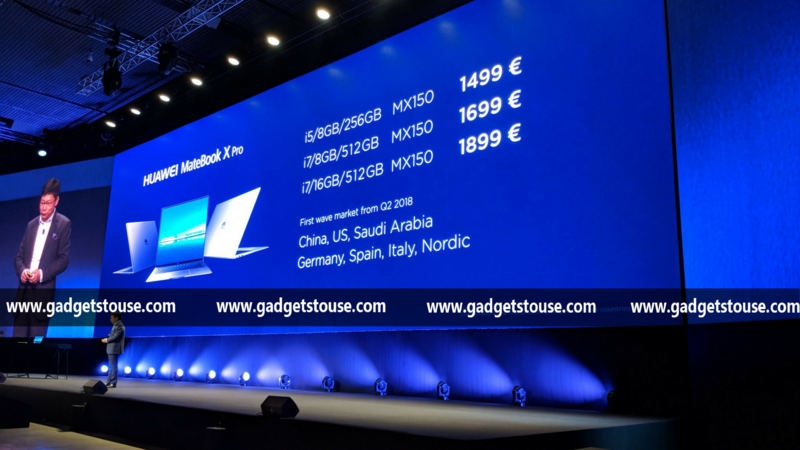 Huawei Matebook X Pro comes in three variants and the prices are; 1,499 Euro (Rs 1,20,000 approx.) for Core i5, 8GB RAM and 236 GB SSD, 1,699 Euro (Rs 1,35,000 approx.) for Core i7, 8GB RAM and 512GB SSD and the price for the top model is 1,899 Euro (Rs 1,50,000 lakh approx. ).